The MTS 5800-100G handheld network tester is the one tool that network technicians and engineers need to install and maintain their networks. It supports both legacy and emerging technologies to address network applications including metro/core, data center interconnect, and business services test applications. 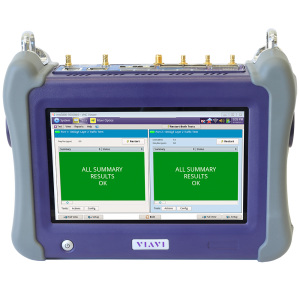 The industry’s smallest handheld, dual-port 100G test instrument can test throughout the life cycle of a network service, including fiber testing, service activation, troubleshooting, and maintenance. Equipped with latest technology interfaces including SFP/SFP+/SFP28 and QSFP+/QSFP28/CFP4, the 5800-100G provides the investment protection needed to manage network growth while keeping customer satisfaction high. With advanced test features such as Optics self-test, Ethernet line rate capture/decode, and OTN Check, technicians can now test their networks faster and more accurately than ever before.